I think it’s time, as I’ve been talking a lot about disciplines to start to expand on these disciplines. So I am going to use the eleven spiritual disciplines set forth by writer Christian George in his book Godology: because knowing God changes everything. These eleven Disciplines can be found on page fifteen of the introduction where George challenges his readers to trade their rakes for shovels and go deep.The 11 Disciplines that George outlines are Prayer, Obedience, Art, Journaling, Silence, Fasting, Vow Making, Meditation, Solitude, Labyrinth Walking, Practicing God’s Presence. These 11 Disciplines, when applied at different seasons of our lives build on our relationship with Christ and can even help us build on our relationship with one another. So for the next 11 posts of this blog we will be looking at what I call “Good Discipline” and specifically the 11 that George has given us. I like to think of Prayer as a telephone, yes I know this is definatly an inadequate example. There is more to prayer than just being able to call God, as we’ll discover, it’s about communicating with God, actually communicating with Him. When we pray we can be by ourselves or we can gather together in a small or large group and pray together, we can pray one on one, we can pray all the time. Prayer is a very important Discipline, don’t believe me consider that Luke gives us 11 instances of Jesus going out to pray by himself. In the book of John we get a whole two chapters of Jesus just praying for His disciples as He’s about to go to the cross. Jesus last hours before getting being arrested were spent in such fervent prayer that one of the gospel writers describes as “sweat like drops of blood.” Prayer is important, if it wasn’t there wouldn’t be instructions given to us in Matthew 6:5-14. So prayer is important, but what is it? And what is it not? I recently put out an article on praying in troubled times. In that article my words may have come across more as Therapeutic Deism, that was not my intent, God will not make our suffering better, He will give us a way to get through, that is why praying in times of trouble is important. So prayer is not some way to make us feel better. Prayer is also not a way for us to boast, consider the Parable of the Pharisee told in Luke 18:9-14, who thanked God that he was not like the tax collector, while the tax collector couldn’t even lift his eyes he was so ashamed of his sin. So prayer is not a way of boasting in our greatness, instead it is something to be done in secret (see Matthew 6:7) or humbly in groups (Matthew 18:20). Praying helps to build unity between us and God as well as us and other believers. I remember a night not too long ago when the 10:31 Life Ministry Team got together with a few of our friends and prayed over our campus. In that moment we were all united in a common prayer and in the fact that we were, through prayer seeking after God. One night, after a particular troubling situation was brought to my attention, my brother and I went down to the lake and spent and hour in silence, praying and seeking God through scripture. In this moment we were united with God as we sought to align our wills with His. Often times we use prayer for our own personal gain. I can remember several nights (and will have many more) when I’ve prayed for God to give me a good grade on a test I didn’t adequately study for.. Other prayers I’ve prayed include really wanting a relationship, or even what I’m going to wear the next day (no giggles please). But in going to God for what I want never seemed to satisfy me, and to be honest I never got what I wanted, and if I did it was only temporary. Prayer, especially contemplative prayer, is a time to discover the will of God. What do I mean by contemplative prayer? I mean what Henri Nouwn meant when he wrote “Contemplative prayer deepens in us the knowledge that we are already free, that we have already found a place to dwell, that we already belong to God” (In the Name of Jesus, Henri Nouwen, Crossroad Publishing, 1989). By this we can say that when we are praying we enter into the presence of God. Prayer is also a tool for thinking God, as kids we always used to pray “God is great, God is good, thank you Jesus for our food, give us Lord our daily bread….amen.” We used to pray a prayer similar to this before every meal, it was a prayer of thanksgiving, thanking God for the food we were about to eat. Prayers of thanksgiving also take the form of thanking God for something that happened, a major life event like a promotion at work might inspire you to pray a prayer of thanksgiving. Pray doesn’t have to be audible, we can pray through thoughts, a few of my friends even write our prayers out, especially when we are praying for one another. It is not only encouraging, but, over distances, allows others to know that we are truly praying for them. Prayer is our connection to God, Christian George calls it our “Direct line to divinity” (Godology, Christian George, moody pub. 2009). It is through prayer that we can actually have a conversation with God, to take our cares and burdens to Him, but also to hear directly from Him, to discern His will for specific situations we might be facing. So right now I challenge you to take an hour out of your busy schedule and devote it to prayer, take your bible and pray the scriptures, pray the psalms, take your cares and your burdens to Him who wants to bring you into His rest (Hebrews 4:11). Then Listen, as the Lord meets you in that place hear what He has for you and pray for conformation. 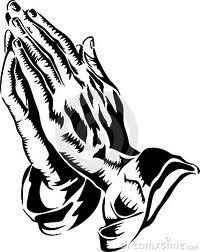 Dear friends, in every situation, let us pray!